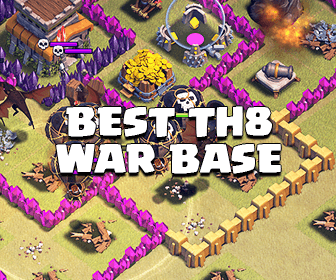 Hey all, so after many requests, we’re going to look at a bit of TH9 War strategy and specifically how to achieve that all important 3 stars. Most people would agree that TH9 is probably the most fun Town Hall to be at currently given the huge variety of attacks you can use to get three stars. As a result, instead of focusing on one particular th9 tactic, I’ve taken a look at several attacks and tried to show as many different current tactics as possible in the below video. 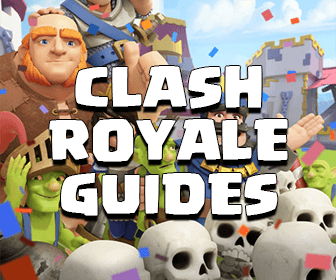 Before I go through typical TH9 3 star tactics, it may be a good idea to watch the attacks relevant to you (listed beside troop names) so you get a better idea of some of things I’m talking about in this guide. I’ve specifically tried to film more interesting attacks rather than just the typical Laloon, LoGoWi or GoHoWi. This is a great hybrid air and land attack. It’s quite complex to carry out due to the amount of troops used but the idea is to push in with a couple of Golems and wizards with the support of your heroes to clear as made anti-air defenses as possible as well as take out the enemy CC. From there it’s a simple Laloon attack using the Lava Hounds to tank the remaining air defenses whilst deploying the loons behind them into hastes and rages. Rage over the air defenses and haste over the outside perimeters to help the loons travel further. Tip: Save a couple of your loons to use on the “back-end”. This means that if your loons to happen to bunch up towards the end, you can release the couple you’ve saved whilst the defenses are focused on your other troops. This is a really cool attack and one which will help ease you into TH10 attack as well. The Archer Queen Healer Combo is very strong at all levels currently and one of the benefits at TH9 is that with enough healers, the AQ really can do considerable damage to an entire side of a map. In the video examples, the AQ takes out the enemy CC as well as multiple defenses leaving a very clear path for the BK, Golem and Valkyries to head into the center of the map and the hogs to sweep up the outside defenses. Tip: If your AQ is under too much pressure, rage both the healers and the AQ to help keep her alive – this may even save you having to use her ability early on. Only viable on certain bases but the best way to really incorporate the Valkyrie into your attack. Start off with your Golems (normally 3 including CC) on one corner and place your wizards behind them. Make sure you take our all surround buildings to create a clear path into the center. Release the Valkyries and your heroes to inflict maximum damage under rages and heals into the center. Even with no jumps and against high level walls you will find the Valks inflicting huge damage as long as you can keep them live. It may be good to keep a couple of wizards back to help finish off at the end from the back. Tip: Watch out for giant bombs – be ready with your heal to keep those Valks alive for as long as possible. This attack can be done with or without Witches but personally I always like to add a few in as it makes the attack more interesting. In both cases, you will want to spread your Golems along the adjacent of one side of the enemy base, clear the outer buildings with your wizards and put your witches down so that the skeletons and Golems can set off as many Giant Bombs (for hogs) and kill as many air defenses (for loons) as possible. Then place your loons or hogs on a neighbouring adjacent side, keeping a few back for back-end use at the end. 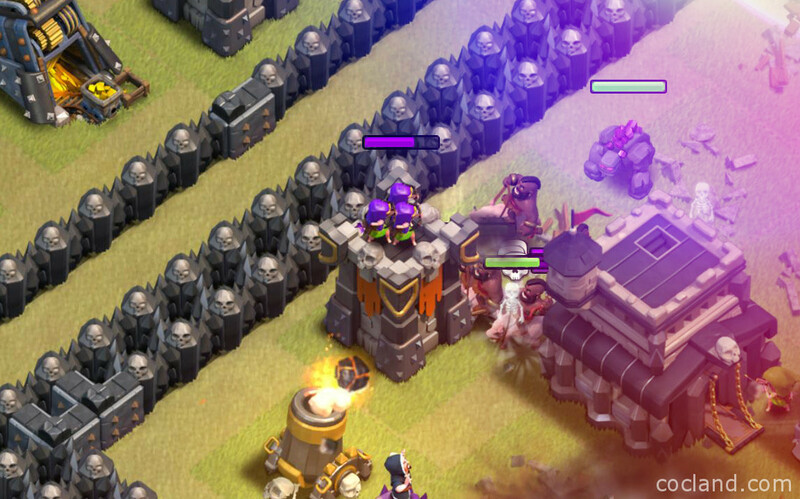 Whilst the central defenses are still focusing on the Golem, your hogs/loons should tear through the base from another side getting rid of the defenses extremely quickly. Tip: Deployment needs to be quite quick here as if you let the Golems die before you get the rest of your troops down you’ll be in trouble. Make sure you know where you are going to drop everything before you start the attack as it will feel quite rushed and pressured once you do begin. This is similar to the first attack I spoke about except there is no Golem or wizards to help take out troops. You can have a few more healers and more loons, potentially even some minions as backup. The key is to take out as many air defenses as possible as well as making sure you get rid of the CC and enemy AQ in its entirety. Ideally you won’t lose your queen as having the Heroes healed will certainly help you with the 3 stars if the loons don’t work out perfectly. Be patient with the AQ and use hastes and rages wisely to get maximum damage out of your loons. Tip: Try to make sure your loons don’t bunch up – ideally you want two loons going in per defense to begin with and then pathing through the base in a straight line rather than bunching up together where it will be easier for defensive buildings or traps to take them down quickly. Thanks for reading/watching and as always please don’t forget to subscribe to Chucky’s channel for more strategy and tips in Clash Royale & Clash of Clans. All support is seriously appreciated! !